Chart based on 133 repairs. 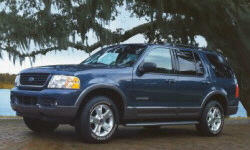 See TSBs and recalls for the 2003 Ford Explorer. Chart based on 113 repair trips. The repair cost chart excludes repairs made under warranty, do-it-yourself repairs, and repair trips that include maintenance. See repairs for all Ford Explorer model years. 5000 mi April 2004 A/C no-op. Warranty repair. 27000 mi The following was covered under the Extended Warranty (and was told only because of Ext Warr! ): New transmission & cooler. Timing chain rattle. Hood rust (since re-appeared). ECM reprogrammed. 68000 mi Ext'd Warranty: A/C operation intermittent. New control head installed. C $90 Wiring harness for windows loose. US $80 Driver's seat heater went out. US $40 Shudders occasionally at about 40mph, since towing with overdrive still on. Think I messed up the transmission a little bit. Mechanic couldn't find anything wrong, advised always locking out overdrive when towing. US $60 Multi-function (turn signal) switch failed, replaced with OEM part. US $170 #3 fuel injector failed and was replaced. Spark plugs also replaced. 96000 mi Air conditioning compressor was in need of replacement- dealership replaced at no charge because I had just purchased it used. 97200 mi Driver's side rear window motor stopped working. Dealership replaced at no charge because it was missed in inspection before I purchased the vehicle. US $424 Paint on roof directly above driver began to peel. Top coat of white paint only, primer underneath was still intact. Ford refused to even consider a repair based on poor paint quality. US $500 Failed wheel bearing w/ damage to hub bearing race. 93000 mi Heated seats stopped working; turning on rr defrost turned on all interior lights & gave "door ajar" warning. Dealer claimed bad harness to liftgate. $600+ (seriously!) repair was refused. Vehicle returned--issues had disappeared! US $600 Corroded ground: rear defrost, automatic light timeout and heated seats no-op. Heated seats still not functional. A $275 Slow leak in radiator plug. Can wait. Ball joints required to be replaced at next service. 52000 mi Broken duct vent in dash. Rear window motor replaced. US $25 Replaced rear stabilizer/sway bar links. US $70 Rear A/C blend door not working and constant clicking noise. Plastic part connecting radiator hose to engine failed. US $150 Thermostat housing cracked leaked coolant. US $200 Upper control Arms/ball joints. 107000 mi blender door not allowing air conditioner to work properly. due to cost, will fix myself with help of friend. US $536 issue had been previously reported as blender door. was actually fresh air intake assmbly. i believe was damaged by previous dealer work/maintenance. new dealer repaired without issue. US $200 Transmission servo wore out the case. Replaced with aftermarket o-ringed version. US $100 Transmission shift solenoid pack failed. Repaired under certified warranty. US $281 Left wheel bearing making noise. Had it replaced. US $650 Thermostat housing was leaking. Flush coolant, replaced thermostat housing and refilled. 171000 mi Thermostat stuck open. Vehicle wouldn't reach operating temperature. US $110 Re-flash computer to resolve surging on deceleration/coast. US $585 Front wheel bearing failed. Had fuel filter and trans filter replaced at same time. Unable to duplicate poor mpg issue. US $50 Rear spring on the passenger side was broken. C $90 Suspension started sqeaking at bumps. Opened and lubricated. C $450 Check Engine Light came on. Driver side Oxygen sensor needed to be replace. US $90 Rear calipers... $90 and did them myself. They were frozen but still working. US $360 Ford dealer told me eventually would need to repair about 20k ago but not to worry. Last oil change they said it was bad- and it was! They said 450 for repair- told me I could save almost 100 if went to small mechanic shop! thanks! US $300 Replaced rear springs because right side broken. US $200 Cracked rear hatch trim below the lift up glass. Plastic body color trim piece cracking vertically. Mine cracked in 2 places over the period of 2 years, upon second crack, I replaced. bought part online, had painted professionally, I applied. US $40 We hear a rattling noise but dealer could not hear it. US $225 Rear end broke and was leaking fluid. See our lemon odds and nada odds page to see vehicles with no repairs or vehicles with more than three repairs. 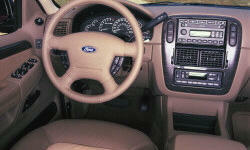 To see how frequently 2003 Ford Explorer problems occur, check out our car reliability stats.